We all know of families that have suffered terribly from long illnesses or sudden deaths. Estate planning is how a living person counts his or her blessings and assigns those blessings to heirs or charities. Estate planning offers you the comfort and peace that stem from knowing that your loved ones are to be taken care of in the event of your death or disability. By choosing people of sound character to execute your wishes, you also save your heirs from the burden of trying to guess your intentions and from the strain of a family feud. Estate planning involves legal documents and provisions such as wills, trusts, financial powers of attorney, healthcare powers of attorney,”living wills” or advance medical directives, guardianships, conservatorships, deeds, joint accounts, and other special arrangements. A comprehensive estate plan is comprised of more than just drafting wills and trusts. It includes a array of documents to serve varied functions and requires coordinated planning and professional advice tailored to your unique situation and lifestyle if interrupted suddenly by death or incapacity. It can also involve business succession planning, life-insurance matters, comprehensive tax planning, entity creation, and charitible and family giving. Comprehensive estate planning puts into writing what needs to be known and done to ensure the orderly distribution of your estate. Every assets can and should be assigned so that your heirs need not spend time and money settling your affairs in probate court. A well-crafted estate plan can also reduce the tax burden on your estate and in some cases avoid most forms of taxation. The probate process allows property to be transferred from the decedent’s estate to the decedent’s beneficiaries. It includes transferring real property, personal property, vehicles, and intellectual property as well as overseeing estate sales, preparing tax documents, paying the estate’s debts, filing court documents, and a lot more. Some creditors have priority over others, so do not pay off any particular creditor until you know the assets and liabilities of the estate and the priority of debts under the law of that state. You do not want to pay off the credit cards only to find out there is not enough money to pay the funeral expenses. Look at the will and see if you need to be bonded or to take formal inventory. Inform the decedent’s banks and lenders of the death so they might be on the watch for fraud. Consult an attorney, even for just an hour, to get an idea of the complexity of the estate. Most importantly, change the locks on all properties immediately and take possession of the vehicles; you do not know which relative or neighbor has a key and can make things disappear. Such thefts cause great distress for the family. It can be difficult to identify the best legal steps for the efficient and timely transfer of assets after the death of a loved one. A probate attorney will be able to guide you through the probate process and assist you with the administrative tasks needed—from filing a petition for appointment as administrator to conducting an inventory of assets to transferring assets to making disbursements to the heirs. If all goes well, the probate court’s supervision will be minimal, but the probate court’s attention is needed in certain situations, e.g., to settle disputes between parties claiming the decedent’s assets, to resolve challenges to the will’s validity, to collect debts that the decedent is owed, and to transfer title of the decedent’s assets to the rightful beneficiaries. If you wish your heirs to avoid probate court altogether, it is possible through comprehensive estate planning which assigns each asset to your preferred heir outside of your will. Do I really need a will? What happens if I don’t have a will? What is in a will? Can I write out my will by hand? When I die, what happens to my electronic accounts and social media? If my spouse dies, can I access his or her financial accounts? If my spouse dies, who owns the house? If I am injured or incapacitated, who will pay my bills? If I’m severely injured or near death, how can I authorize my family to “pull the plug”? If my spouse is in poor health, how do I provide for him or her? If I have a disabled child, grandchild, or spouse, how do I provide for him or her? If my child or grandchild has a worthless spouse, how can I protect his or her inheritance? If my spouse and I go down on the same airplane, how can we provide for the custody and finances of our minor children? Why might I want to put some assets into a trust? What is a trust? If I have been appointed administrator (a.k.a. personal representative, executor, or executrix) under someone’s will, what do I need to do? What should I do if my parent’s debts are greater than the assets in the estate? What can I do if my sibling is handling my parent’s estate and is messing things up? What happens to the family’s investment property when my parent dies? How could my parents avoid sending any property or issues to the probate court? What are inheritance and gift taxes, and how can I avoid them? These and other questions have good answers—often several good answers—based upon the complexity of your assets and family. Consult an experienced attorney whose daily work is helping families protect their interests and preserve their assets. 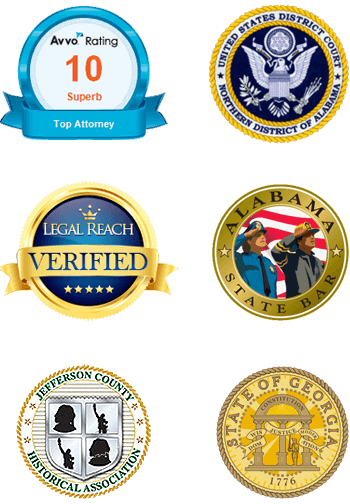 Contact James B. Griffin today at (205) 502-2199 to schedule a consultation.